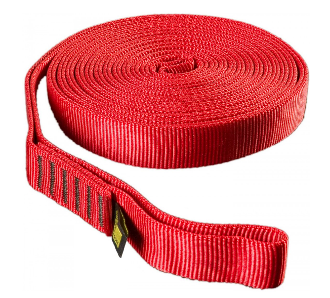 The Hasty Harness from North American Rescue is a resourceful tool with unlimited applications and is an indispensable part of any webbing equipment toolbox. This multi-purpose harness is ideal for the critical adaptability needed during high threat rescues. The NAR Hasty Harness is constructed of a circumference of approximately 22 feet of 1 in. Tech Tape that outperforms its military spec counterpart in strength, flexibility, knot-ability and durability. Opposing color thread to aid in visual inspection. Packaged: L 6.6 in. x W 4.3 in. x D 1 in. Circumference: 21 ft 10 in. Loop: L 10 ft 11 in. x W 1 in. All items must be visually inspected for any deterioration of stitching and webbing both before and after each use.